Aged beef patty, upside down in-n-out special sauce, cheese, onions, lettuce & tomato. Today I am sat on the train travelling down from BLHQ for a special burger tasting event and innovation meeting – more on that another day. To pass the time I am listening to an array of movie and TV scores, one of them being the moderately recent smash Netflix hit Stranger Things. 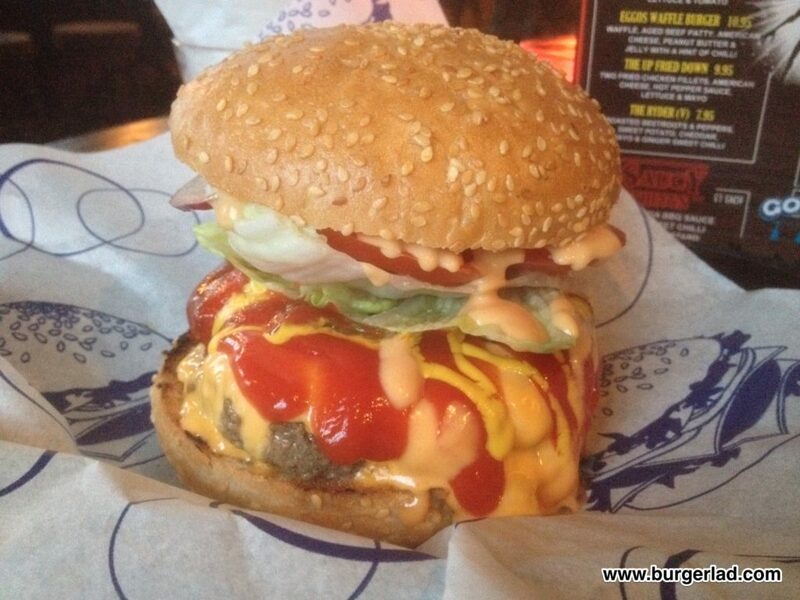 As part of my trip to London I fully intend on making a pilgrimage to one of THE BEST burger joints in the Capital – Lucky Chip. 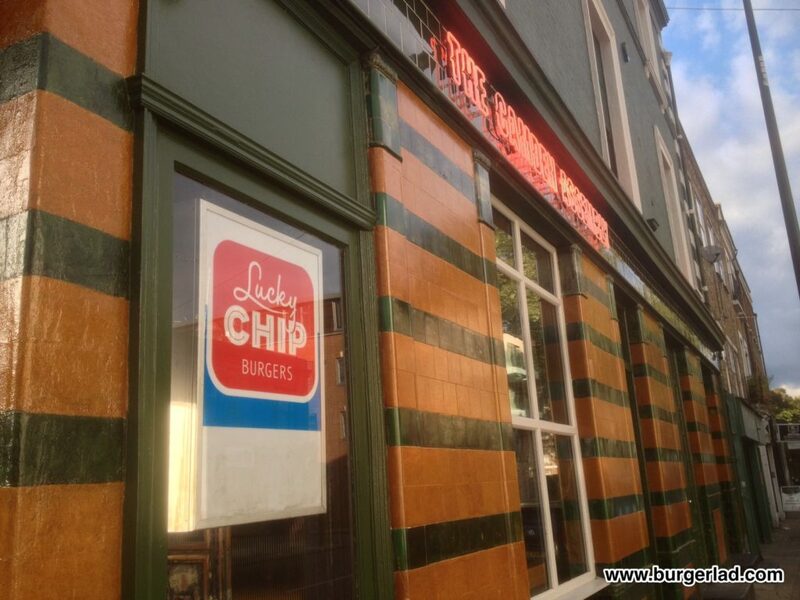 Lucky Chip is based in three locations at Dalston, Islington and Camden. And it is the latter that I will be visiting today. My meeting doesn’t finish until approximately 2pm so I could get the train home then. 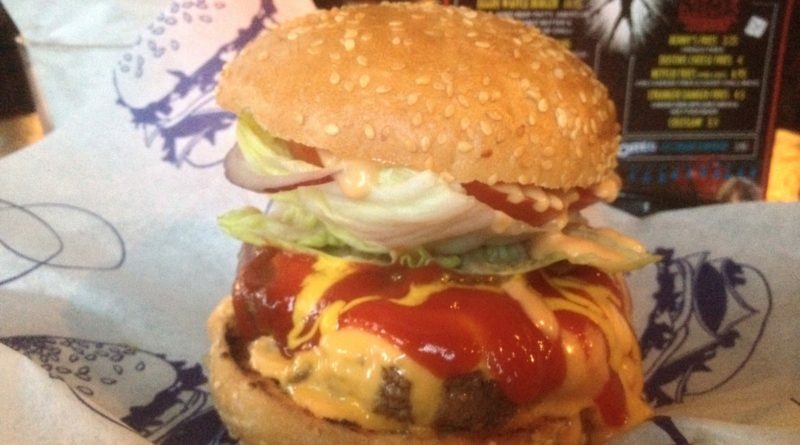 But I want, scratch that, NEED to try this burger so badly I will wait around in London until they open at 5pm. The reason for this (apart from their fabulous reputation for great eats) is that for October, Lucky Chip has developed a menu inspired by the aforementioned television series. For the uninitiated amongst you, the first season of Stranger Things revolves around a young boy who disappears one night on his walk home which coincides with the sudden appearance of a girl with special powers. It’s a fantastic show by the Duff Brothers, set in and inspired by the 80’s with a hint of E.T., Poltergeist, The Goonies and The X-Files in my opinion. The score is also worth checking out! Anyway… back to the Lucky Chip Stranger Things menu. I don’t believe that I have ever been more impressed and/or excited by a movie or TV-themed menu. The artwork is superb and if you check the Lucky Chip website out they currently mimic the opening titles of the show. Of all the burger joints I could have chosen today (I had to miss out on an invitation to Flaming Cow to be here) it just HAD to be Lucky Chip I went to. Just look at the menu. 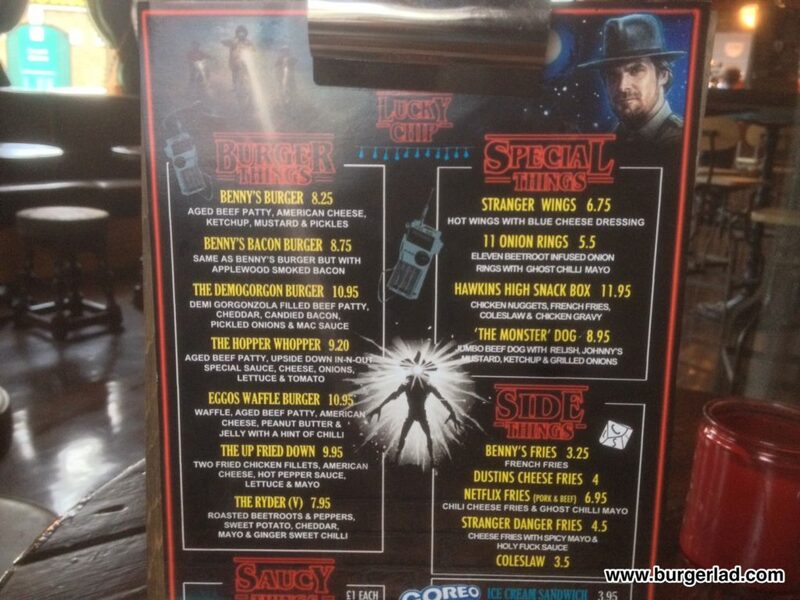 Fans of the series should have a wry smile on their face when they look at such creations as Benny’s Burger, The Demogorgon Burger, Eggos Waffle Burger, The Up Fried Down (brilliant) and the Hawkins High Snack Box. Clever, imaginative and with a sense of humour. I loved it. 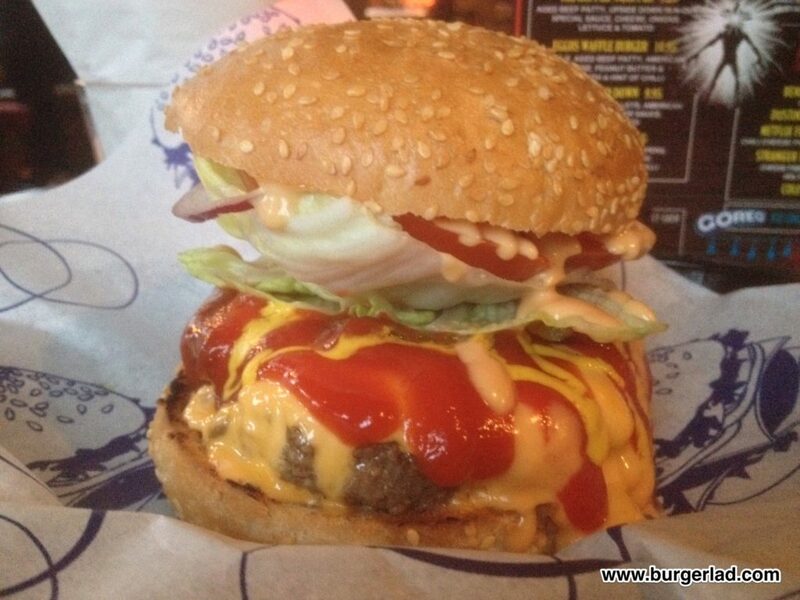 But there was one burger I HAD to have – The Hopper Whopper. Named after the fictional towns Police Chief, Jim Hopper played by David Harbour, this features the signature Lucky Chip aged beef patty with special sauce, lettuce, onion and tomato – in my mind, Lucky Chip’s version of a Big Mac (plus tomato). I could have picked any of the amazing sounding burgers from this inspiring menu but for me, it had to be this one. Inside Lucky Chip it’s like your “typical London boozer” – don’t go expecting a fancy restaurant or “gourmet burger joint”. The Camden Assembly is a decent and welcoming pub that just happens to be the home of Lucky Chip. And it’s a good place to visit… and just a short walk from Chalk Farm Underground Station. I was pushed for time as my train home from Paddington was leaving soon and when The Hopper Whopper was presented in-front of me I felt a pang of despair. The Hopper Whopper was practically doused in ketchup. It was everywhere! 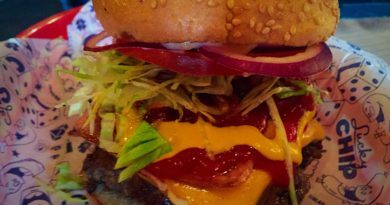 I’m not a fan of ketchup and can normally eat a burger with it on but not to the extent it was slathered all over the build like this one. There was also mustard on it too which was also not in the description on the menu. To say I was disappointed has to be the biggest understatement I have possibly ever written on this website. Bitterly disappointed. I didn’t bother saying anything to the staff initially as I literally did not have enough time to wait for another burger to be cooked. I had to eat and run. 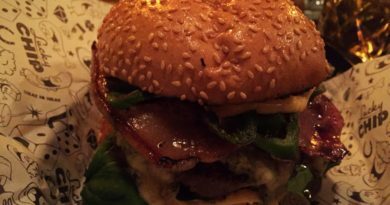 I had as many bites as I could stomach as I really needed to sample a burger by Lucky Chip which is so revered by the London burger crowd and our own Admiral Burgerbar – he proclaimed it to be his best burger of 2016 way back in February. I don’t actually believe this is true of the Stranger Things menu. Why would you bother going to the effort of developing these fantastic individual creations only to undermine them all by having a universal flavouring of ketchup and mustard? It also doesn’t say anything on the menu such as “by the way all our burgers also come doused in ketchup and mustard”. I reached out to Lucky Chip owner, Ben Denner asking him if The Hopper Whopper should come with ketchup so liberally applied. His response? Nothing. 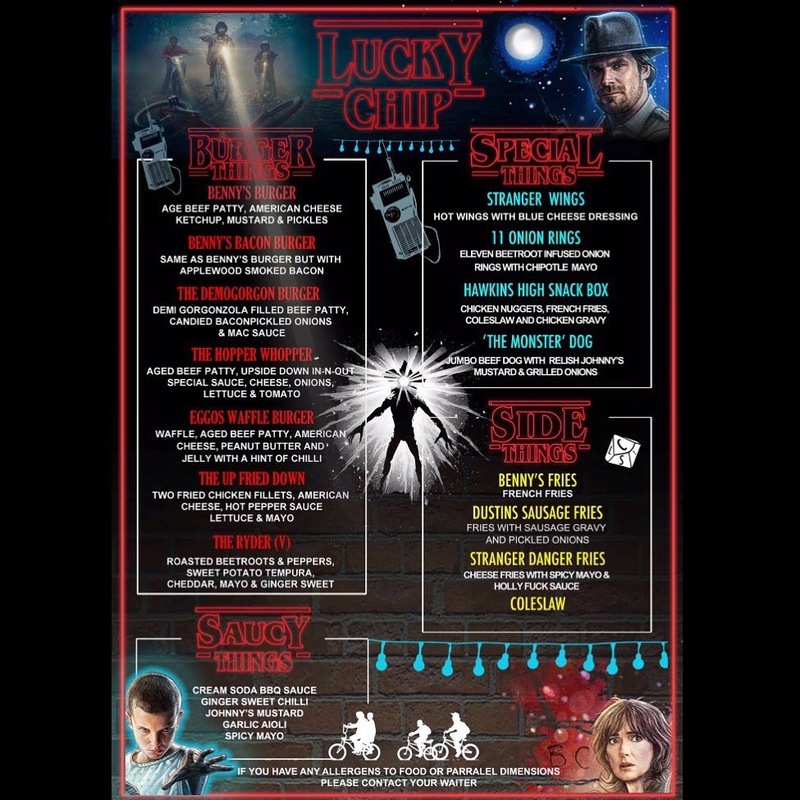 I had told everyone about the Stranger Things menu at Lucky Chip. Everyone!! Friends, colleagues, family, associates, Mark Wahlberg, the cat. Anyone that would listen. And I walked, sorry ran away (train to catch) from Lucky Chip full of sadness and disappointment. Oh and my hands stunk of sickly sweet ketchup too. Londoners are lucky – see what I did there? 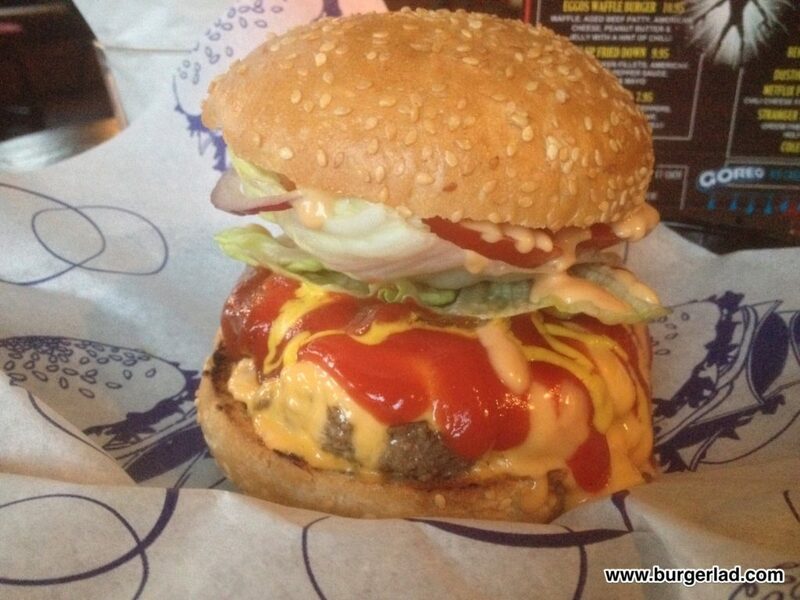 They can jump on and off the Tube and sample a plethora of amazing burger joints. For those that don’t have this luxury, when this sort of thing happens, it is truly disappointing. Hmmm what a shame, I almost felt your pain during that run to the station! I must admit I do like mustard and ketchup on my burgers and dogs…however…as soon as I saw the photo I knew in what direction the review would go. Thats a ludicrous amount of sauce, and half of it is already running off the patty before you even squash it down to eat. Hit and a miss for this one! I also went to sample a lucky chip burger, at the Dalston branch and happened to get there during the Stranger Things promotion. Both my and my partner’s burgers were undercooked. They were out of onion rings. Service was poor and the kitchen was running behind because of ‘a big table downstairs’. It was a real disappointment.